PosToken is the world’s first Proof-of-Stake smart contract token on Ethereum platform. It’s an ERC20 Token which follows the ERC20 Token Standard and implements all standard methods. PoSToken first implements the Proof-of-Stake mechanism, meaning that holders of PoSToken can earn some extra tokens just by holding PoSToken for a period of at least 3 days, greater than or equal to The Minimum Coin Age. PoSToken is the first implementation of PoSTokenStandard, a brand new unofficial Ethereum Token Standard, which is defined in the code of PoSToken and is devised specifically for issuing Proof-of-Stake Tokens. PoSToken is just a start of Proof-of-Stake tokens and the PoSTokenStandard will help developers issue more PoS tokens in the future. That’s the real purpose of PoSToken. We believe that a new era of Crypto Tokens starts here. 8. Then click «Add» and you will see your PoSToken in the wallet. According to the above annual interest,the Max Total Supply of PoSToken (10M POS) will be reached in about 15 years.Once 10 Million is reached, no more PoSToken will be generated via PoS. 1.Sending a transaction to your own address with any amount. 2.Using MyEtherWallet.com or Mist or any other software that can interact with contracts to execute mint() function. For now you have to use MyEtherWallet.com or Mist or any other software that can interact with contracts to execute this function. It maybe a little inconvenience for you, need to have some practical experience of interacting with contracts. But don’t worry about this, we have taken this into account and a Wallet for Proof-of-Stake tokens has been added to our development plan. We will soon release the first version you can test. By using our PoS Token Wallet, you can easily start PoS mining just by clicking one button. Worth mentioning that the wallet will support any tokens based on the PoSTokenStandard. function annualInterest() constant returns(uint);Return current annual interest. function coinAge() constant returns(uint);Return coin age of your account. Return 0 means that your coin age doesn’t meet the min coin age now.If you are not sure about your account’s coin age, you can execute this function for query. 1.If Bob received 10 tokens from Alice and held it for 60 days, we say that Bob has accumulated 600 token-days of coin age. 2.Additionally, when Bob spent the 10 tokens he received from Alice, we say the coin age Bob accumulated with all tokens in his account had been consumed (or destroyed). The second round airdrop will last for 2 weeks, start on September 24th, 2017 at 15:00 UTC and last until October 7th, 2017 at 15:00 UTC. Different from the 1st one, the 2nd Round Airdrop is totally unconditional (no twitter restrictions) and free, all you need is a bitcointalk account. The airdrop will stop immediately when the airdrop supply (currently 728,235 POS) are all claimed. All the remaining tokens that haven’t been distributed after the 2nd round airdrop, will be allocated for a 3rd Round airdrop. We will do our best to make the airdrop as fair as possible. 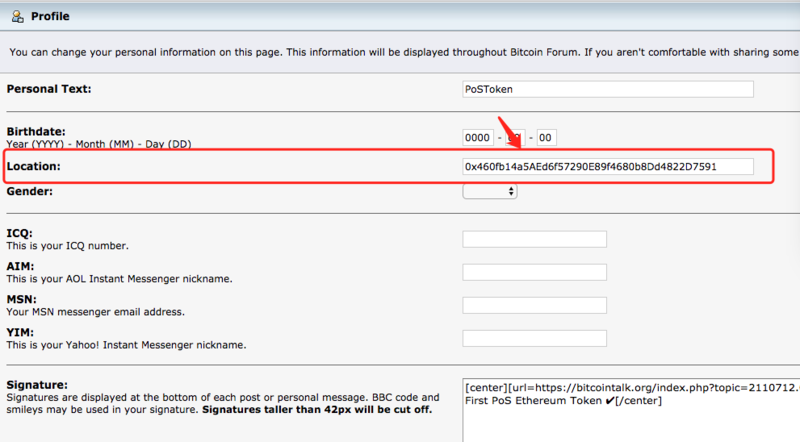 1.First of all, put your ETH address in your bitcointalk profile in the «Location» field . This is a very important step: our system will collect your ETH address by scanning your bitcointalk profile and we also need to verify that you have access to the bitcointalk account you submit to us. Btw, once you registered, you’re free to remove it. 3.You only need to register once and then you’re eligible for all future airdrops. 1.One person can only register for once. If it is discovered that multiple registrations belong to the same person, your registration will fail. 2.All members include newbies are eligible. 3.All accounts registered on bitcointalk.org after August 22, 2017 are not qualified. 4.Bitcointalk accounts with negative trust are not qualified. 5.All accounts accept airdrop need to keep 90% of the tokens received on the account during the whole airdrop period. 6.All accounts who accept airdrop should pay close attention to PoSToken including our ANN thread and website and twitter or others from official. 7.Final explanation right belongs to the PoSToken Dev Team. 1.Participants must make at least 1 valid post per day. 2.Spamming, low quality posts, copy paste and off topic posts will not be counted. 3.Posts must be at least 15 words long to qualify. 4.Participants can post anywhere in the bitcointalk forum you wish. 5.You should not have a negative feedback on your profile. 6.Once you applied, you cannot change the signature until the airdrop ends. 1.You must follow us on Twitter @PoSToken. 2.You must retweet at least 5 post from our twitter. 3.Your Twitter account must have at least 100 real followers. 4.If it is discovered that your twitter is a bot account, or has fake followers etc. you will be disqualified from the bounty program. 5.One person can only apply for once. 6.All twitter accounts that submitted to us in the 1st round airdrop are not eligible. 1.The video must be original and created by you. 2.Your video title must include the words «PoSToken»,»Free Airdrop». 3.Only accounts with at least 50 real subscribers are allowed. 4.The video should talk about our project positively. 5.The content could be introduction to PoSToken, information about our airdrop, PoS mining guide or other thing as long as it contains correct information. 6.One person can apply at most twice. 1.Must contain more than 300 words and not be directly copied from website or ANN thread. 2.You can post your articles on your own website/blog or Reddit/Steemit/Hackernews/Medium or other similar resource. 3.Articles can be written in any language. 5.Must contain only unique content. 7.The content could be introduction to PoSToken, information about our airdrop, PoS mining guide or other thing as long as it contains correct information. 8.One person can apply at most three times. The more people you refer to our airdrop, the more PoSToken you will earn. We will offer extra bounty for 5 members who have special contribution after the second round airdrop (200 POS / member) , including republish or help to promotion or keep active in this thread or sth else. This is a summary of our roadmap, more details will be updated after the airdrop completed. If you have any ideas, feedbacks please send us a PM or Email:contact@postoken.org. ██████████ ✔ PoSToken — First PoS Smart Contract Token — Get Your Free Tokens Now!